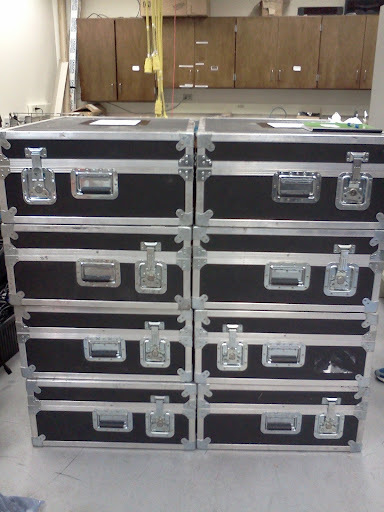 For getting sensitive equipment to pole we use these impact resistant cases. This is the first batch and the start of the long journey south. The tons of equipment we'll be needing this year, including my personal stuff like favorite corn nut snacks and favorite fleece jacket are packaged up carefully here in Madison, palletized and containerized, then driven probably by truck to Port Hueneme on the California Coast where the US military will put them on a boat headed for New Zealand. From there they make it to Christchurch airport where they'll be loaded up on a LC-130 or C-17 and reach McMurdo. They won't be staying there for long as they will make it onto a LC-130 and be at Pole where I can enjoy my corn nuts in my favorite fleece while setting up some new network switches.